Near Vertical Drum Lifter. 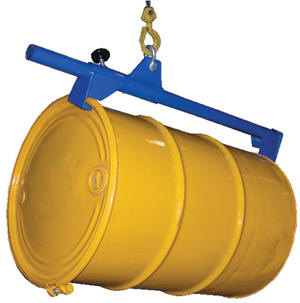 This product is designed for the transportation of 55-gallon closed head steel drums with an overhead lifting device. Adjustable attachment points allows drum to be lifted in a horizontal to a near-vertical position. Easily attaches to any drum with both a top and bottom lip. Adjustable top attachment point for use with different height drums. Steel construction. Powder coat blue finish.Specs: acceptable drum heights 16" and 40"; capacity 1,000 pounds.